The cash flow of a Private Equity investment and therefore of the the Private Equity fund investing in such securities has a negative return or cash flow during the initial years, usually during the first 3 to 5 years. After this period the investment should produce positive returns and the Fund is expected to begin to have increased evaluations of the underlying investments. The chart below shows how cash flows in Private Equity, when plotted against time, show a J shaped curve. There are various ways to consider return that one can look at such as Internal Rate of Return, Return on Investment, or Net Asset Value, for ease of use and simplicity I will stick to Cash Flows. The first years of the life of a Private Equity Fund are used to scout for suitable investments. This may take up to 2 or 3 years while the fund manager evaluates the best sectors, industries and companies that may make up a potentially profitable investment. The investor however commits capital to the Fund from the beginning. Management fees, which usually range from 1.5% to 3%, are drawn on the whole amount of capital committed to the Fund from the onset of the Fund. Clearly as there are no net positive cash flows during the first years, then returns will be negative throughout this period. While investments are sought and implemented and fees are being charged on the total of committed capital on an annual basis increasing further negative cash flows. Investments made will in principle be of two kinds; successful and out-performing or unsuccessful and under-performing. The unsuccessful investments will usually tend to be identified early on, whereas the performing investments will need more time to see the strategy brought forward and more time will be needed before positive returns or cash flows are seen. This deepens the trough in cash flows as some of the capital invested will then be written off early in the life of the fund. It’s no surprise this part of the curve is known as the valley of tears. Some Managers are more conservative than others and write off under-performing assets sooner and only revalue the performing investments closer to exit period. This will increase the depth of the trough and show positive cash flows later on in the life of the fund. This can be some what alleviated when the securities allow for Mark to Market evaluations. Lastly but possibly most importantly, market timing will also have an impact on the shape of the cash flows. The quicker a Manager is in investing the fully committed capital and the further away the positive cash flow generated from the investments are, the deeper the trough will be. An Investor in Private Equity will be seeking out-performing returns compared to the Publicly traded markets as a reward for the illiquidity and lumpiness of Private Equity investments. Due to the nature of Private Equity investments this reward comes at the cost of negative cash flows during the early years of the investment. The J-Curve then creates concern for some investors in that it is a given that the first 3 to 5 years of the investment will not show positive returns. This produces drag on the overall performance of an Investors Portfolio creating uncertainty or under weighing when making an allocation to the Private Equity part of a portfolio. Investors are also aware that during the first 3 to 5 years of the investment they must maintain the committed capital available for drawdowns by the fund Manager, creating opportunity loss during the period the capital is committed but not invested. 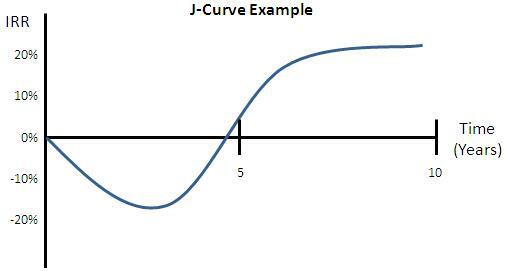 It is not completely possible to cure the cause or effects of the J-Curve, however steps can be taken to spread the loss of income and mitigate the J-Curve effect. Management Fee Holidays are of great help in deferring the burden of paying management fees at all during the investment period. This period does not give positive returns and paying management fees on the whole committed capital can produce negative Interim Internal Rates of Return and reduce the final Multiplier or IRR. Investors can also look to stagger investments in their Private Equity allocation. Choosing to split the allocation amongst different managers and strategies is recommended to diversify the risks of investing in Private Equity funds. At the same time it is possible to apply the different allocations in different years so as to smooth out the effects of the trough in the J-Curve. Another way to reduce the J-Curve effect is to allocate a part of the Private Equity investments to funds that specifically target debt type securities such as Mezzanine Debt or Distressed Debt which may see positive pay-outs earlier than typically shown by Venture or Leveraged Buy Out funds. Secondary investments are becoming more and more popular as Investors and fund Managers seem to be have closed the gap in evaluating funds. Buying into a Private Equity fund that is close to producing positive cash flows can greatly reduce the undesired characteristics of the J-Curve. Investor’s interest for these deals has been growing which has meant that the discount to Net Asset Value which they demand to make the purchase has also been shrinking. This correctly aligned evaluations of NAV and greater Investor interest have helped create a larger secondary market.